How we’ve used Google Docs to organize our wedding planning process. A few weeks ago, I discussed how to find and organize inspiration for your wedding. And, one of the very first blog posts on SuperNoVABride explained how to organize your wedding planning process. One of those ways was to use Google Docs. So, here’s how we’ve used Google Docs to stay organized while planning a wedding. 1) Collecting Guests’ Addresses. I can’t take credit for this idea. I read about this idea from Google itself. For folks that you have e-mail addresses for, or for folks that have Facebook or some other social networking account, you just have to send them a link to the form that you create and they can click on it and fill in all the relevant information! 2) Expense Tracking and Expense projections. I’m a freak about tracking my expenses. 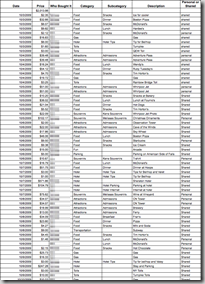 If you don’t believe me, here’s a screenshot of our expenses from recent vacations. Then, to make it fun, we have a separate expense analysis sheet to determine how all that money was spent at a quick glance. For your wedding expense tracking spreadsheet, I’d recommend setting up two tabs. One for actual expenses and one for projected expenses. (Don’t forget to delete your entry from projected expenses once you put it on your actual expenses tab). This will help you 1) keep track of all the money you have spent, and 2) by including your projected expenses, you’ll ensure that you’re more aware of your actual budget situation. Sharing the document will allow both you and your fiance (or whoever else) to add their wedding-related expenses without having to e-mail it back and forth to each other. 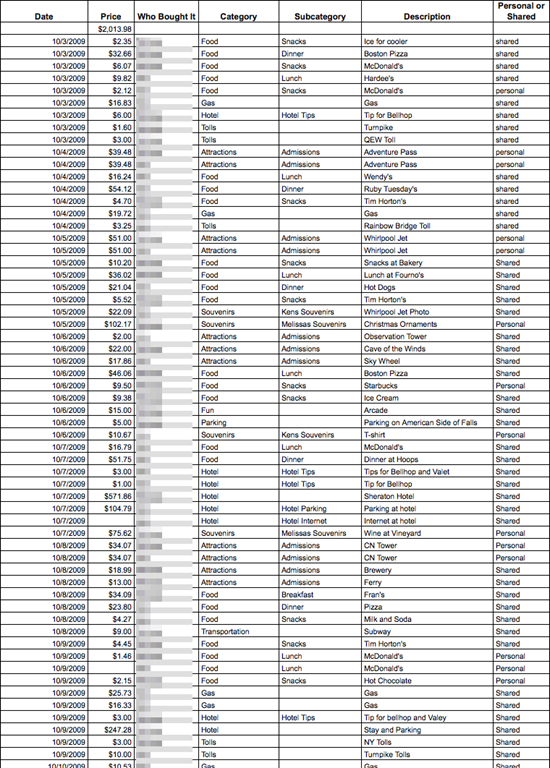 There are a ton of different spreadsheets you can use in Google Docs, but this is the only one I’m going to discuss in this post. I’ll have another post about that! 3) Centralized storing of wedding contracts. Although we have a shared “weddings” folder (folders are called collections in GDocs) on Google Docs that my fiancé and I share, where we save things like our expenses spreadsheet, we created another folder specifically for “Wedding Contracts.” We take copies of all our signed contracts and save them to the Wedding Contracts folder. That way, we don’t have to go digging back through our e-mail to find our contracts and invoices. We have also shared this folder with our month-of wedding coordinator so that she has everything on hand. 4) Saving correspondence with vendors. Any correspondence that you have with vendors, I always save the e-mails to our shared Weddings folder. Once again, this will help prevent the need to go searching through your inbox for the relevant e-mails. 2) You can then share that folder with all the people involved in your wedding planning process. Then, you don’t have to forward additional e-mails to them. All they have to do is check the updated folder. 3) It’s better than saving it to a hard drive folder alone, that way you can access it whenever you’re online, no matter what your location. So, there you have it! Now go! Sign up for Google Docs and get your wedding organized!